As all Hot Shot Secret products they keep us running down the road. You may use the 150K in the 1999 Ford E350. However, we recommend NOT adding more than 10% of the total volume if mixing the two. Even though the MotorCraft Anti-Freeze and the Hot Shot’s Secret Anti-Freeze will mix together and are compatible, when mixing additive packages, you may not get 100% protection. If you are planning on adding more than 10%, we recommend flushing your entire cooling system and adding the 150K. Thanks! can this be used to exchange all of the coolant on a 2013 ford F150 5.0L? 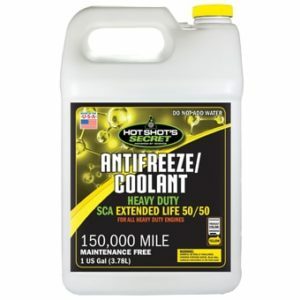 150,000 Mile Heavy Duty Extended Life coolant is a universal product that is compatible with all makes and models and will mix with any coolant on the market. Our unique additive package contains nitrite which helps prevents wet sleeve liner cavitation in diesel engines by blocking the imploding air bubbles.